The Machine – Does It Change Everything? During HP Discover last month Meg Whitman said of The Machine “This changes everything”, so what is The Machine and does it change everything? MoonShot is a hyper-scale computing platform, but as well as that its other USP is its efficiency. The need to develop a more energy efficient computing platform was based on the premise that the current approach to computing is not sustainable in terms of power and space requirements. HP quote the Moonshot as using 65% less power, 90% less space and 98% lass cabling than traditional computing. When the MoonShot server first came out HP talked about it being a software defined solution, but now that terminology has been used extensively for another meaning it appears to have been dropped from HP’s literature. But what they meant when they said software defined was that the cartridge you chose would be defined by the application requirements i.e. 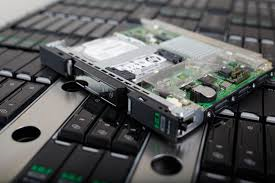 different workloads would benefit from different server cartridges. The Machine project is seen as being as so important by HP that it is investing two thirds of its R&D money in it, so this is almost an all or nothing bet. The name The Machine came about because HP is designing a new computing architecture that it sees as being applicable to all situations from your phone right up to hyper-scale computing. HP started developing The Machine to contend with the exploding digital universe and a predicted 30 billion connected devices by 2020. This level of exponential growth was seen as unsustainable with current architectures and demanded a new approach to computing. As discussed earlier HP sees Moonshot as a close relation to the machine project, in that its goals are similar to enable efficient computing for tomorrow’s ever growing demand. Where The Machine differs from MoonShot and every other computer out there today is that it is based on a completely new computing archituure. The existing computing architecture The Von Neumann model has existed since 1945 and changed little in that time. Special purpose cores – This means customised hardware for specific use cases. MoonShot is already using specialised cores for different workloads, check out this Moonshot product guide which gives an idea of how different cartridges exist for different work loads. Photonics – Instead of using copper wires between components, fibre cables with light are used to bring a big boost in speed. This technology also allows multiple servers to be combined together using the high speed interconnects. 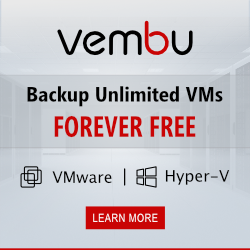 Universal memory – This is one of the key enhancements and creates one universal area of memory which does away with the separation of memory and disk. This universal memory area is as fast as RAM whilst allowing data to be stored permanently. 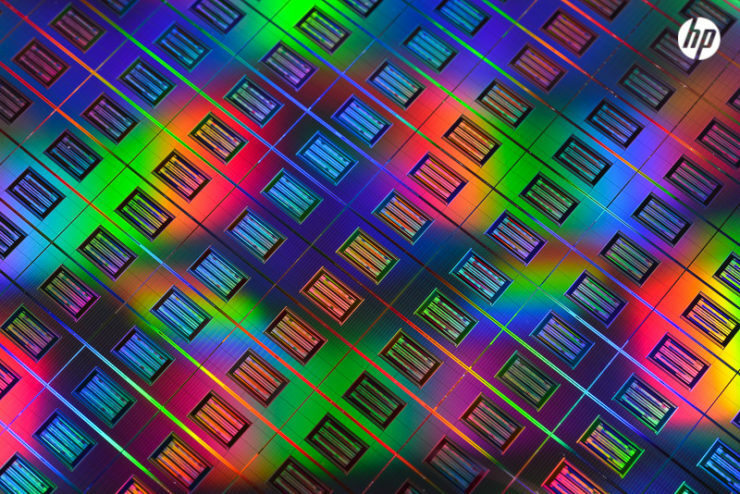 HP are calling this unified memory area memristors. How the elements fit together can be seen in the diagram below. One of the aims of The Machine was to flatten the data hierarchy. 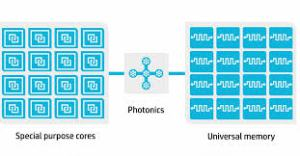 Storage and memory become one with universal memory, then high speed communications between special purpose cores and universal memory is enabled via photonics. Does The Machine Change Everything? The capabilities of the hardware on paper certainly seem like a game changer and it makes sense that a new architecture is required given the changes that have occurred since the The Von Neumann model was conceived. Given the amount of money that HP is ploughing into this and that it is effectively staking its reputation on it, you would have to bet that they will go on and deliver the hardware. But I think the main challenge they will face is inertia. What will push manufactures to want to put this new technology in their new phone, car etc. for what will inevitably at least initially be a higher price point. Couple this with the challenge of developing an OS from the ground up and developing applications around it when most OS’s have decades of development around them and you can see the initial challenge faced by HP will be vast. History has also shown that the best technology often doesn’t become the most successful, such as in the classic video recorder standard battle where VHS went on to become the dominant platform even though it was technically inferior to Betamax. Another lesson from history is that the innovator doesn’t always go on to become the dominant market player. For example during the 70’s Xerox invented much of the modern computing world we see today – Ethernet networking, laser printers, and the PC but considering the scale of the innovations didn’t go on to be a dominant market force in any of these areas. I think the need for a new computing platform given the exploding digital universe is a given, HP attempting to be the company that takes us there is a bold and confidant move. Is it the right decision, ask me again in 10 years.